If you think you can't draw - think again. 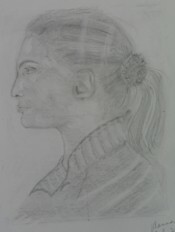 Everyone has to learn skills and attending drawing courses is one of the best ways to learn a new skill. Learning to draw is about learning how to see - how to see things differently to our normal everyday 'seeing'. You don't have to have been with an extraordinary talent to draw - any of us can learn to draw with the proper instruction. Since Betty Edwards' published her best-selling book Drawing on the Right Side of the Brain millions of people around the world have learned to draw using her methods. However, learning to draw from a book isn't always easy. It can be difficult to find the time to practise the exercises, it's easy to get distracted and it can be a struggle if you get stuck and have no one to ask for help. 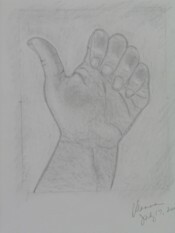 However, Dr Edwards also developed a 5-day drawing course based on her book and this course is now being taught by Anna Black in the UK, under license from Drawing on the Right Side of the Brain Inc.
Learning to draw in a class is very different. Numbers on the drawing course are small so you are always assured of attention, and students learn from, and encourage, each other. Why not give yourself the gift of five days of dedicated time to learn a new skill that you will have for life and is sure to bring you much pleasure. Learning to draw boosts your confidence and will make you feel more creativity - with all the knock-on benefits that will bring in your personal and professional life. The last one is a bonus - you don't have to learn it separately as it just evolves out of learning the first four skills. Once you have mastered these skills you will have the skills to draw landscapes, portraits, the human figure and still lifes. Improvement will come through practising your newly-learned skills and mastering different media. You will also different strategies for accessing the right brain (R-Mode) at will. R-Mode is a form of processing that is best suited to drawing but unfortunately R-Mode usually loses out to the more dominant left brain (L-Mode). DAY 1: You will learn about edges. Edges are about lines.You will do a pre-instruction drawing as a record of where you are before instruction (it can be hard to remember how far you have progressed when you look back at the end of the course if you haven't got this proof). You will learn about blind contour drawing and modified contour drawing and you will copy a Picasso portrait of Stravinsky using the upside-down drawing method. DAY 2: You will learn about negative space. You will do two drawings - a hand drawing and a drawing of a chair. DAY 3: You will learn the art of sighting angles and proportions. You will do a sighting drawing of a building or internal space. 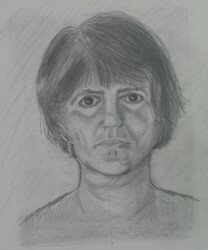 DAY 4: You will learn how to draw the human face and use light and shadow. You will draw a face in profile. DAY 5: You will learn light logic - light and shadow and how it affects your drawings and you will learn how to draw a face. You will draw a self-portrait. Learning to draw can bring up all kinds of anxieties so throughout the course, the emphasis is on building your confidence and teaching you to look at your drawings and others with an appraising, but non-judgmental eye. After each drawing session there is a critique of the drawings which is an opportunity for students to talk about what they learned and where they struggled. A great chance for everyone to learn from each other. We all tend to be overly critical of our own work so it's good to get positive constructive feedback from others who are seeing it without our own personal 'blinkers'! The material on this page describing the course and the skills learned is taken fromThe New Drawing on the Right Side of the Brain (Harper Collins Publishers, 2001)by Dr Betty Edwards (© Dr Betty Edwards). It is reproduced with permission, from Drawing on the Right Side of the Brain Inc. 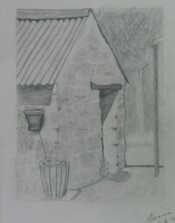 Drawing courses usually take place at different locations around the country, in a variety of venues. Arrangements can usually be made for non-drawing partners to attend residential courses as well. Please ask! If you have any questions, please don't hesitate to get in touch. You can contact me here. Alternatively, sign up for our newsletter Drawing Matters to keep up to date with new course dates as they are announced, along with site changes, drawing tips as well as other drawing-related events and exhibitions.